Nikki Gemmell is a successful Australian writer with a string of novels and children’s books to her credit. This book is about the tsunami of emotional, psychological and physical problems after her mother ‘euthanized’ herself; Gemmell doesn’t like ‘suicide’ because it implies the unhinged and irrational. Gemmell’s mother had problems with intractable, unresponsive pain, which left her dependent and crippled. Philip Nitschke, long-time advocate of euthanasia and assisted dying, tells Gemmell that her mother contacted his organization, Exit International, and that she had (illegally) imported Nembutal. He describes this as empowerment. And he adds that anyone opposing his views is either not mature or is suffering ‘religious claptrap’. I don’t necessarily disagree with those sentiments, but I will never support the legalization of assisted dying because of what it brings with it. In every jurisdiction where assisted dying has been legalized, there has been disregard for the laws and safeguards that were put in place to prevent abuse and misuse of these practices. I have concerns that the majority of the medical profession are not adequately trained to formally assess decision-making capacity, and lack the psychiatrist’s skills to make sure no patients with treatable conditions like depression go down the assisted dying path (and that includes me, on both counts). Many doctors cope poorly with severe pain or suffering and rapidly resort to the ‘nothing more can be done’ position, which is halfway to assisted dying. How can you be sure the person is not being pressured by family or socioeconomic issues? How do you manage people who feel a burden or who are ‘tired of life’? Where do you draw the line? ‘Euthanasia creep’ is inevitable – when legalization of assisted dying for a very limited group of people in very limited circumstances is expanded to include more people in more situations. In the words of Robert Twycross: ‘Once the barrier of legislation is passed, medically assisted dying takes on a dynamic of its own and extends beyond the original intent, despite earlier explicit assurances that this would not happen.’ Or Herbert Hendin: ‘Virtually every guideline set up by the Dutch – a voluntary, well considered, persistent request; intolerable suffering that cannot be relieved; consultation; and reporting of cases – has failed to protect patients or has been modified or violated.’ Remember the one thousand patients a year that were euthanized without request, never mind consent, in the Netherlands? Now the Dutch doctors say that in 50 percent of the cases where palliative or terminal sedation is used, the intention is to hasten the death of the patient, i.e. it is euthanasia. The Belgians have championed the cause that euthanasia is a normal part of palliative care, and there are now moves afoot in Canada to censure any palliative care service that declines to provide assisted dying (see separate review Henry et al Palliative Care). Gemmell’s book is excellent and I had trouble putting it down. It is a dreadful story and extremely personal. 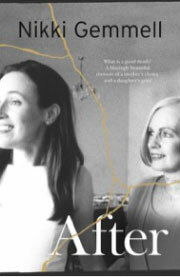 But she writes so well and the emotional aspects of the turmoil are vividly portrayed. 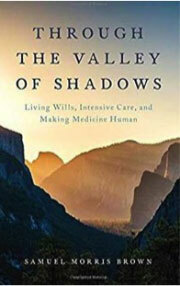 I would happily recommend this book to anyone who works in palliative care. You will be drawn into her story and it provides a raft of issues on which to reflect – where the current system doesn’t work, where it’s doing harm. On the legalization issue, Gemmell and I start from different positions and with different data and, not surprisingly, come to different conclusions. Again, lots to think about. This is a big book, with 62 chapters written by an impressive list of 91 contributors. I was a little surprised when this book appeared, coming so soon after the last edition of the Oxford Textbook (Ferrell, Coyle and Paice (eds.) 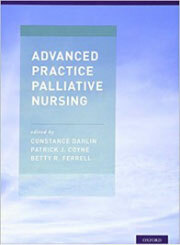 Oxford Textbook of Palliative Nursing. 4e. Oxford University Press, 2015). It states that the current book is designed for Advanced Practice Registered Nurses (APRNs) working in hospice and palliative care (more than 1,000 are registered), and builds on The Oxford Textbook. Unfortunately, I had donated my copy of the Oxford Textbook to a nursing school and could not directly compare the two. The book is divided into eight parts. 1: The Palliative APRN; 2: The Palliative APRN across healthcare settings (acute, ambulatory and community; the last has several chapters about working in hospice); 3: Pain and symptom management (physical and psychological/psychiatric); 4: Communication; 5: Spiritual care; 6: Special situations (withdrawal of technology); 7: Special populations, and 8: The Pediatric Palliative APRN. I liked the symptom control chapters, which I thought had a reasonable degree of detail. The chapter on Grief and Bereavement opened well – ‘…grief is recognized as a normal response …’ – but then sank into the mire of DSM-5 psychopathology and persistent complex bereavement disorder (PCBD). For spinal cord compression, they admit there is no consensus on the dose of steroids (it’s the first time I have seen that in an American textbook), but go on to infer that glucocorticoids and corticosteroids are alternatives. The chapters on withdrawal of cardiac, respiratory and other life-sustaining therapies are definitely a sign of the times. I liked the chapter on cognitive impairment, discussed across the board, which is appropriate when dealing with an ageing population. The chapter on palliative sedation is sanitized: euthanasia is described but there is no mention that it is done without request in the Netherlands; palliative sedation is described, but there is no mention that in 50 percent of cases in the Netherlands, it is performed with the intention of hastening the patient’s death (Griffiths et al Euthanasia and Law in Europe Hart Publishing, 2008). I asked some hard questions. Having just read Larkin’s book Compassion, I looked it up. Eleven lines about compassionate presence; considering it is at the very core of palliative nursing (and palliative medicine), that’s not much in what is a big book. I looked up euthanasia and assisted dying; they were defined in a box in the chapter on palliative sedation, but there was no attempt to discuss how you might deal with patients requesting assisted death. I asked about HIV/AIDS. Just a page, and half of that was a case history, for which no outcome was described. As far as the management of patients with HIV/AIDS is concerned, I would have thought that if they were in the good group and responding satisfactorily, there would be a big role for continuing palliative/supportive care; and if they were doing poorly and going down hill, they would definitely deserve palliative care involvement. 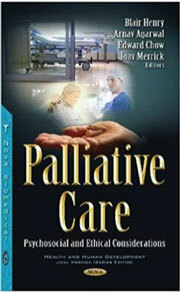 Overall, this is an excellent book for advanced practice nurses in palliative care and hospice in the USA. There are bits that refer to bureaucratic and hierarchic matters specific to the USA, but most of what is here would be helpful to advanced practice nurses/nurse practitioners in other developed countries. 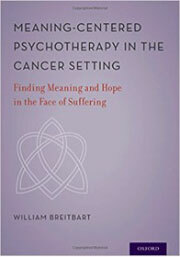 In her Foreword, Jimmie Holland explains the evolution of meaning-centered psychotherapy (MCP) for the existential concerns of patients with cancer as developing from the ideas of Victor Frankl (Man’s Search for Meaning, Beacon, 1992), the Viennese psychiatrist who, despite years of brutality in the Nazi concentration camps, believed the one thing they could not take away was the meaning he gave to his own life. She says it has taken ten years for this type of therapy to be developed and validated and that Bill Breitbart has played a central role. 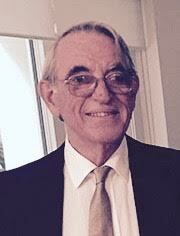 The first half of the book comprises 14 chapters from a distinguished cast of contributors. The opening chapter discusses the existential framework for MCP, with separate chapters on group and individual therapy. These are followed by chapters on MCP for cancer survivors, cancer caregivers, and MCP adapted for grief therapy and for adolescents. There are then chapters on MCP in Chinese, Spanish, and Israeli patient populations. The last chapter piqued my interest – Enhancing Meaning at Work and Preventing Burnout: Meaning-Centered Intervention for Palliative Care Clinicians ­ – it left me wondering what difference it might have made if they had sorted all this out before I started in oncology and subsequently in palliative medicine. The second half of the book consists of two appendices. The first comprises transcripts of a full course of an eight-session MCP group intervention with an exemplar group, conducted as part of a randomized controlled trial. The second comprises transcripts of two full courses of a seven-session individual MCP intervention with two exemplar patients, also conducted as part of a randomized clinical trial. I am not trained in psychiatry and do not feel comfortable judging this book at that level, but as one reasonably versed in oncology and palliative care I can say it sounds both useful and valid. If you work in oncology or in palliative care with a lot of cancer patients, this book will give you insights into their psychological suffering and how you may best be able to help them. I liked the presentation of the theory and the practice in the two parts of the book. And as a bonus, there is a chapter about looking after yourself and how to deal with burnout. Dr. Samuel Brown is an intensive care unit (ICU) specialist from Utah and also the founder and director of the Centre for Humanizing Critical Care at Intermountain Medical Center. This book is about the inhumanity of intensive care units and what might be done to make the care compassionate and humane, bringing wholeness and healing to patients and families facing life-threatening illness. The book is divided into three sections – past, present and future. The first contains chapters on the history of approaches to death in America with an emphasis on the rise of modern ICUs, the history of advance directives, and the empirical and ethical problems that make living wills ineffective. The second includes chapters on the cognitive and emotional factors that limit the usefulness of living wills, how the ethos of ICUs is anti-patient autonomy, and life after life-threatening illness. The last includes chapters on the current state of attempts to improve the care for patients with life-threatening illness, and new directions we should consider as a society and as a medical system. An epilogue describes how we might better address the possibility of life-threatening illness. If you work in an ICU, or in palliative care in a system that includes intensive medical care, there is a lot to think about here. I got off to a bad start with this book. First, I had only an e-book, which I think makes reviewing twice as hard. Second, there was no explanation of the raison d’être for the book, or whom it was intended to help. Third, the first ten pages were a long list of the other titles in Nova’s Health and Human Development series; if you missed it on the way in, they are listed again from page 223. The editors are, in turn, a bioethicist, a medical student and a professor of radiotherapy from Toronto; Merrick is a professor of pediatrics in Jerusalem. As far as the content is concerned, there is discussion of a small number of selected issues that fall into the area where psycho-oncology and palliative care overlap, but there is no effort whatsoever to discuss all the psychosocial and ethical aspects of palliative care. Each chapter/topic comes in the form of a literature review. After a brief introduction, there is detailed information on which databases were searched and how and why the retrieved references were culled, after which there is some information from the selected references. As often as not, the conclusions were that there was insufficient information, different studies were not comparable, and further research was needed. Some chapters, like those on depression in advanced cancer, and that on cultural and religious considerations, did not provide any new information, and I know of much better discussions of these topics; that is not to say that what is presented here is not a fair assessment of the selected papers. The discussion on palliative sedation for existential suffering died because there is no widely respected definition for either term. In the chapter on the impact of do-not-resuscitate orders on mortality, I think ‘impact’ is a very unfortunate choice of word when exploring for any relationship. There were a few chapters that piqued my interest. Deactivating implantable cardioverter-defibrillators (ICDs) – ethically permissible, but associated with physician reluctance/discomfort, as well as concerns that the patient has usually not had the opportunity to previously discuss the question. And one on barriers to home deaths in Canada – inadequate support services, insufficient family caregivers, inadequacy of home locations, and discontinuity of care by family physicians. You would think that list would give the politicians and healthcare planners something concrete to work on. But we are told that only 16-30% of dying Canadians are able to access palliative care services. Then there is the chapter on medical assistance in dying (MAID), written by Kathryn Morrison from the Department of Philosophy at the University of Waterloo in Ontario. Here, I was told sternly that ‘if [palliative care units] PCUs conscientiously object to MAID … then they are neglecting to fulfill their responsibility to honor their own missions and values.’ Sounds as though she wants them censored, following which they will probably have their funding withdrawn. I have gone on record before about philosophers who live in ivory towers and have no clinical experience or insight, but who insist on telling clinicians how their work must be done. Ho, hum. Sebastian Sepulveda is a nephrologist from Massachusetts, who has specialized in emergency medicine and end-of-life care; I thought those were unusual credentials. Gini Graham Scott is described as a nationally known writer. This book is aimed at the educated person who is dealing with difficult end-of-life issues for themselves or a loved one. The book is a good idea, but I wondered if it was set out in a manner that made the relevant information available to the lay reader. If you are dying of heart disease, you don’t want all the guff about end-of-life care for cancer, and vice versa. The chapter headings – e.g. ‘Close Family, Clear Mind’ or ‘Complications’ – give the reader no clue as to whether this is the chapter that contains the information they are looking for. So for this book to be useful to the lay reader, I think it needs a complete re-do of the chapter and paragraph headings, as well as a list or table at the beginning of each chapter. The book deals with a number of end-of-life issues including cardiac arrest, DNR/DNI (do not resuscitate/do not intubate) orders, withdrawing active therapy, and death in the ICU, each set around the story of a particular patient. I did not agree with everything he had to say. He says that for terminally ill hospital inpatients, there are two ways of delivering palliative care. The first, which Sepulveda prefers, is a team led by the primary care hospitalist (read specialist physician or surgeon without training in palliative care), with an appropriate team of nurses and allied health personnel. The second, that Sepulveda calls his ‘distant second choice’, is the same team but including a palliative care specialist. This may be true for Sepulveda who has special interest and a lot of experience in end-of-life care, but it is inappropriate for 90-odd percent of specialist physicians and surgeons who have no special training in end-of-life care, and even less interest. He is to be applauded for wanting to continue to care for his dying patients, but for the vast majority of hospital specialists I think the exclusion of the palliative care specialist would greatly compromise the care the patient received. I also found some of his clinical recommendations curious. For the woman in a terminal coma, with the family satisfied that she was in no pain, Sepulveda initiates a morphine infusion ‘to be sure she felt no pain’. Throughout the book, patients (i.e. human beings) are described and classified as ‘cases’. When I was in medical school, a surgeon told us, ‘You can have a case of oranges or a case of apples but, here, you have a person with ovarian cancer.’ If a colleague describes a mutual patient as ‘a great case’, I shudder. My concerns about the usefulness of this book for the layperson are expressed above. 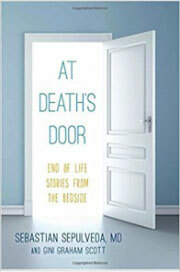 However, for people who work in palliative care, reading this book would allow you to reflect on how you try to assist patients and families with end-of-life issues. It does not matter if you disagree with some of the things he says (as I did), so long as you think about why you disagree.